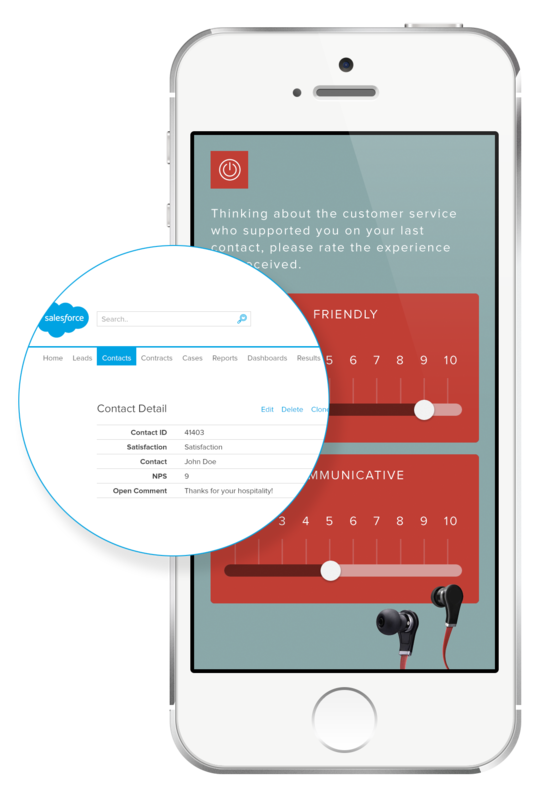 Add a personal touch to your Salesforce surveys. Surveypal for Salesforce allows you to create branded, user-friendly, responsive surveys. Set up dynamic survey questions and content based on customer data in your Salesforce records – including name, location, agent, and more and boost survey completion rates to get an accurate overview of the customer experience. Connect with your customers when it matters. Track and measure the experience in key interaction points. Automatically integrate real-time feedback from your Salesforce surveys with your database of leads, customers, and prospects to close the CRM loop. Gain a deeper understanding of your product or service, the needs of your customers, and the value you deliver to them. The Voice of the Customer is more relevant than ever. Enrich your Salesforce records by tracking and measuring metrics such as CES and NPS to track your performance. Monitor VoC metrics and start building your own Voice of the Customer program straight from Salesforce to stay ahead of the competition and scale your business. Gain quick access to relevant data in real-time. Configure Salesforce surveys to integrate survey responses with Salesforce fields. Build workflows that allow for the right data to reach the right person, at the right time, and enable your team to make informed decisions based on feedback relevant for your business. Extend the power of your Salesforce Marketing Cloud campaigns with Surveypal for Salesforce. Access relevant client information and boost your marketing campaigns. Customize marketing communications based on feedback to create emotional connections with customers and prospects. Create a consistent and meaningful marketing experience by monitoring the efficiency of your marketing campaigns. Automatically trigger surveys after every interaction to track and increase customer satisfaction. Empower customer care staff to access customer information and feedback and improve quality of service and agent performance. Trigger follow up actions based on feedback and deliver proactive support and superior service quality. Surveypal helps more than 10,000 users to implement survey solutions and Voice of the Customer programs into Salesforce and other platforms to boost their customer experience. Join other experts in creating better surveys for Salesforce and other platforms by trying it out yourself! Surveypal with Salesforce to capture the voice of the customer.